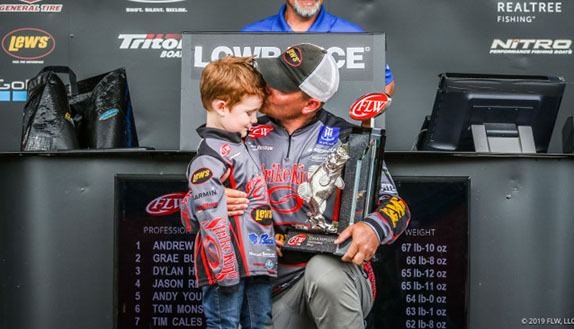 Ronnie McCoy had plenty of support around him on his way to winning the Santee Cooper Southeastern FLW Series. Ronnie McCoy’s practice for the Santee Cooper Southeastern FLW Series last week was going just fine until Wednesday morning, when his cell phone decided to go for a swim in the 60-degree waters. McCoy followed it in, but it was beyond saving once he recovered it. He trailered his boat for the day and shifted his focus to getting set up with a new phone prior to competition beginning the following day. 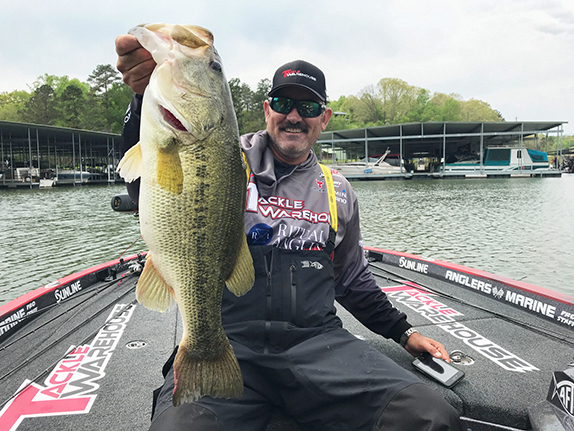 Turns out, losing a day of on-the-water preparation didn’t seem to hamper the South Carolina native who’s had plenty of experience and success at the famed lakes Marion and Moultrie. McCoy, a 53-year-old resident of Lamar, S.C., capitalized on a solid 1-2 combo of a morning shad spawn around clusters of cypress trees followed by sight-fishing for upgrades once the conditions got right later in the day. 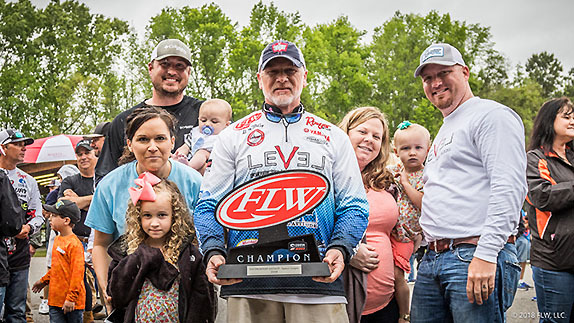 McCoy’s game plan worked to perfection and his execution was near flawless as he tallied up 73-08 over three days to capture his first FLW Series win in just his sixth outing at the triple-A level. 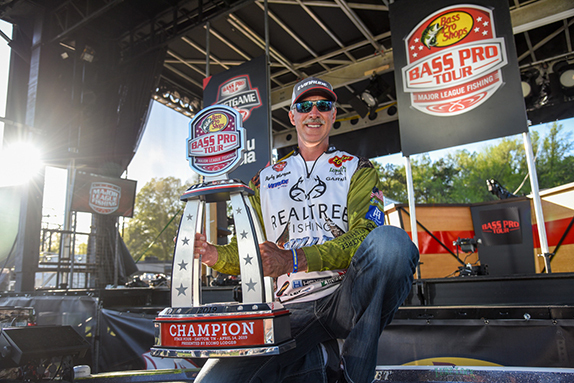 “I didn’t have a leg up, but I had a plan and it worked,” McCoy said, referencing his confidence level at Santee Cooper, especially around this time of year when fish are in the spawning phase. He said compared to previous years, the lakes set up last week as well as he could’ve hoped for. After four days of practice, McCoy felt he had a solid idea of what was transpiring across both lakes. McCoy said the best decision he made all week came on day 1 of the tournament. After catching roughly 16 pounds targeting fish keying on the shad spawn around Rimini on the upper end of Marion, he opted to leave and head down lake to fish for spawners. He wound up bagging a 9-09 and a 7-pounder off the same bed to push his weight up to 26-00 to start the event. “I knew fish were spawning and I knew the shad spawn was going on so my decision to not lean on those fish too hard and go down lake to go looking – that was the key decision,” he said, adding he felt like he was able to manage the fish in the three areas where he’d found them keying on shad. He said the morning shad-spawn scenario is a textbook springtime pattern at Santee Cooper and it was helped along by the full moon that occurred last week. He said the shad would sometimes show themselves near the surface, essentially revealing the general area the bass would be in as well. He said most of the key trees had 2 to 4 feet of water around them and the presence of gator grass was also key. “It didn’t have to be a lot of grass, but it’s starting to come up pretty good in places,” he added. His key baits in the mornings were a homemade white spinnerbait and a white vibrating jig, both half-ounce versions. On day 2, the shad spawn bite yielded better results with McCoy bagging 21-06 before leaving. Sight-fishing brought him no upgrades and he went into the final day in 2nd place, 1 pound behind Daniel Howell. Saturday brought a huge weather change with clouds and rain and wind – not exactly ideal conditions for sight-fishing. As a result, McCoy leaned on the shad spawn fish “until they quit,” he said. He had about 20 pounds by 10 a.m., then caught two key upgrades off other nearby cypress trees to push his day-3 total to 26-02, the only 20-pound stringer on the final day and nearly 7 pounds better than Howell’s effort. It was more than enough to deliver him the biggest win of his tournament career. > Spinnerbait/Vibrating jig gear: 7’3” heavy-action and 7’2” medium-heavy action Level Performance casting rods, Lew’s Tournament Pro Speed Spool casting reels (6.4:1 ratio), 15-pound Izorline monofilament line, 1/2-oz. homemade double-willow spinnerbait (white), 1/2-oz. Z-Man Evergreen Jackhammer (white), 4.75” Black Flagg Slick Shad trailer (white). > Sight Fishing gear: 7’6” heavy-action Level Performance casting rod, same reel, 20-pound unnamed fluorocarbon line, 1/2-oz. unnamed tungsten worm weight, 4/0 Gamakatsu J-Bend worm hook, Zoom Road Kill (green-pumpkin). > McCoy's affinity to the Zoom Road Kill is tied to it being a little-used bait for sight-fishing. It's tough to find in stores, he said (Tackle Warehouse does not carry it), but the simple design and claw action make it a favorite of his. "They catch fish," he said.